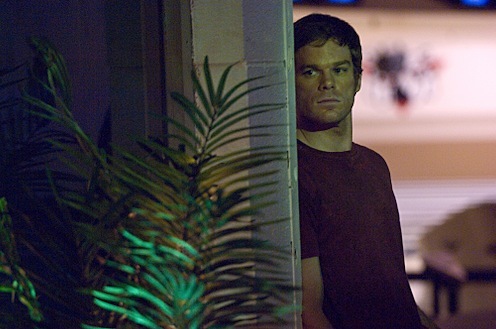 Michael C. Hall does lots of lurking as serial killer Dexter Morgan. CBS hopes to make a big splash -- and slash -- by adding the first season of Dexter to its strike-depleted prime-time lineup. The graphic serial killer drama, which recently ended its second season on corporate cousin Showtime, will be slotted at 9 p.m. (central) on Sundays, beginning Feb. 17th. Starring Michael C. Hall as blade-wielding Dexter Morgan, the series will be edited for broadcast television. CBS entertainment president Nina Tassler says the Golden Globe-nominated drama will "be new and original programming for most CBS viewers. It's also a great match with our existing lineup, affording us the opportunity to promote this critically decorated series in CBS's top-rated crime dramas." Dexter's second season finale set a Showtime record with 1.2 million viewers, a paltry sum by broadcast network standards. ***Jay Leno and Jimmy Kimmel, whose late night shows operating without writers, plan to be each other's guests this Thursday (Jan. 10). They apparently have gotten to know and like each other in recent weeks. That's a big thaw for Kimmel, who mimicked and derided Leno while promoting the Jan. 2003 premiere of his ABC late nighter. Leno lately has been under fire by the Writers Guild of America for writing his own monologue jokes since NBC's Tonight Show returned on Jan. 2nd after a two-month layoff caused by the strike. Comedy Central's two late nighters, The Daily Show with Jon Stewart and The Colbert Report, are scheduled to be back in business on Monday (Jan. 7), both absent their writing staffs. ***Cable's new Fox Business Network is still barely in view, even though it's been on since Oct. 15th. The heavily promoted venture, currently available in about 30 million homes, is averaging a sub-scant 6,300 viewers on an average weekday, according to Nielsen Media Research. Its now entrenched rival, CNBC, averages 283,000 viewers at any time of the day between 4 a.m. and 6 p.m. Those amount to prime-time hours for a business news channel. Comparatively, just about anything televised on a broadcast channel in D-FW is a ratings juggernaut compared to Fox Business Network. Programs with just a 1.0 rating are averaging 24,356 total homes in D-FW. In most cases, the number of in-home viewers watching a given program would be close to double that total.